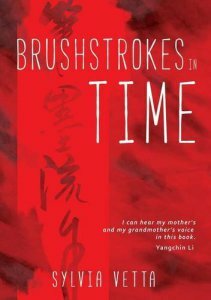 ‘Brushstrokes in time‘, provides a fascinating read about modern China! For those looking for a deeper insight into the recent modern history of China – this book “Brushstrokes in time” by Sylvia Vetta, celebrated Oxford author and journalist, ticks all the boxes. The author, Sylvia Vetta, uses the literary device of a fictional character Xia – odong to be our guide in some of the most important turning points in Chinese culture. This book “Brushstrokes in time” guides us through the establishment of the Stars Art Movement and its vital role played in this short-lived episode by China’s cultural elite, in the exercising of freedom of thought and speech. In addition, Sylvia Vetta provides insight into the byzantine world of China’s artistic political establishment, which makes the Machiavellian double dealing of Washington as portrayed in “House of Cards”, TV series, look very amateur, indeed. As for the narrative, it is very compelling, well researched and yet an entertaining book. Whilst providing an insightful for anyone interested in Modern China and contemporary art in the global scale. “Brushstrokes in time” by Sylvia Vetta is well worth reading and I can’t wait to hear it serialised on BBC Radio 4.